Let the heavens rejoice after 5 years in development Hothead Games has released Swarm. 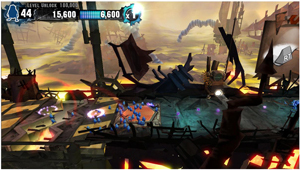 Swarm is a amazing downloadable action platformer game for XBLA and PSN. It’s about a gigantic blue worm that lands on a nasty planet and it’s up to you to control a team of 50 little “Swarmites” at once through 11 levels, collecting points and DNA to help grow “Momma”, get her a new hat and leave the planet. There is one catch though; this path is full of things that burn, trap, electrify and decapitate your swarm at every point and you get glorious points added to your score for it. All you have to do is make it through the level with at least one Swarmite in order to return to Momma. Momma has lots of Swarmites spawn points throughout the levels so if they die, Momma spawns more. This can be helpful because there are points in the game that require you to have a certain number in order for the higher point value orbs to appear. You are rewarded in this game for the collection of things that look like nucleus and DNA. The more you collect in a row helps fill a multiplier which can greatly add to your score, but in a cruel twist, deaths of your Swarmites also add to it. So if your multiplier looks like it’s running out you can just kill off some of your swarm to keep it up. 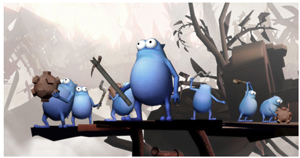 This is the game’s primary mechanic, as you find that most obstacles you encounter or crates to open just happen to kill off some of your happy blue buddies. At the end of the level your amount of Swarmite deaths are calculated up and put towards progressive death medals and the worldwide death total. Deaths in the level also have death medals but are only rewarded when the last 10 of your Swarm encounter the same deadly fate. The game gets progressively harder and (easier if you replay earlier levels) as you get better at controlling your swarm and there are even two boss battles that are unlocked by collecting enough DNA. Some of the awesome things you can get your swarm to do include moves such as jump, dash, huddle together and stack on each other as well as pick up and throw explosives. Sometimes your Swarmites will pick each other up when picking up explosives, leading to some hilarious deaths. The game’s length is 6-8 hours but with the leaderboards, achievements and the constant questioning of Momma asking “Why can’t you be more like (Insert friend’s gamer tag here)” the replay value is high. Here’s hoping there is more Swarm content coming. Hothead Games has taken an old convention that games punish you if you die, turning it around so that death is rewarding. Congratulations to Hothead for taking an original idea and making it shine. If you’re looking for a fun, original type of game don’t let this one pass you by cause you wouldn’t want to disappoint Momma – plus it would make a great gift for any video game loving mom (Mother’s Day is coming up) and you know that would score some serious points. Swarm is on XBLA (Xbox Live Arcade) for 1200 MS Points and PSN (Playstation Network store) for $14.99 Released on March 22nd 2011 by Hothead Games, Swarm is rated T for Teen by the ESRB. This entry was posted on Friday, April 8th, 2011 at 10:57 am and is filed under Action Adventure, Casual, Game Reviews, National News, New Releases, Platform, Puzzle, Teen. You can follow any responses to this entry through the RSS 2.0 feed. You can leave a response, or trackback from your own site.